The use of red roses as a symbol for love and romance has been around for ages. 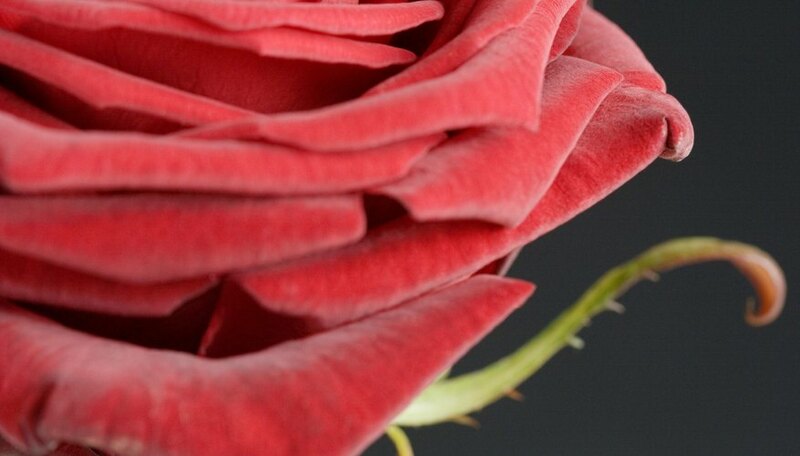 Numerous early cultures used red roses as decorations during marriage ceremonies. This helped instill and reinforce the red rose becoming symbolic of--and synonymous with--love and romance around the world. Roses convey powerful meaning between lovers. Even before civilized times, the color red has symbolized fire and heat, and later the color also came to express strong emotions. The establishment of--and later, the commercialization of--Valentine's Day that played a large role in the modern-day act of giving someone red roses as a symbol of romantic love. Red roses are used by people in a variety of ways. Among the most common is as a direct expression of romantic love. Sending red roses to someone you're in love with--particularly on Valentine's Day or at the budding of a new romantic relationship--is a widespread modern tradition. The usage of red roses in floral arrangements during weddings is a tradition that dates back centuries. In some cases, roses are sent as an apologetic measure to a spouse or lover in order to atone for a mistake or wrongdoing. Although deep red roses are meant as as expression of romantic love, they can also be meant as a sign of deep, nonromantic love and/or admiration. A daughter giving her mother red roses for Mother's Day would be an example of this, as would a lead actress in a Broadway play receiving red roses during a final performance. So in addition to "I love you," red roses can also convey other messages, including congratulations, job well done and respect. Just like there are several different colors of roses, there are different strains of them as well. More specifically, roses come in seven different types: climber, floribunda, grandiflora, hybrid tea, miniature, shrub and landscape as well as tree roses. The most popular red rose varieties are the hybrid tea, which is long-stemmed and usually produces just one flower per stem; and the floribunda, which is a bushy shrub that's more durable than the hybrid tea. The grandiflora, which is also very popular, is a cross between the hybrid tea and floribunda and can grow to up to six feet in height. Although red is most well known and most popular color of rose sold today, other colors continue to thrive, with each having it's own meaning. There are white roses, with the white symbolizing purity, innocence and heavenliness, among other things; pink, which stands for appreciation, grace and happiness, and yellow, which is for friendship, joy and new beginnings. Other colors include black, orange and peach. Nero, Mark. "What Is the Meaning of Red Roses in Romance?" Dating Tips - Match.com, https://datingtips.match.com/meaning-red-roses-romance-13197060.html. Accessed 19 April 2019.